There are between 17-20 living species of Penguins. 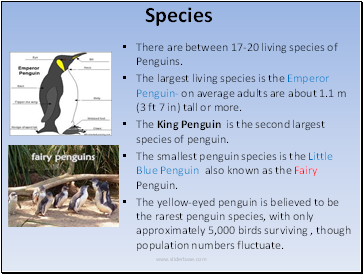 The largest living species is the Emperor Penguin- on average adults are about 1.1 m (3 ft 7 in) tall or more. The smallest penguin species is the Little Blue Penguin also known as the Fairy Penguin. The yellow-eyed penguin is believed to be the rarest penguin species, with only approximately 5,000 birds surviving , though population numbers fluctuate. Emperor Penguin –A Brave Soul! Winter arrives in Antarctica in March. 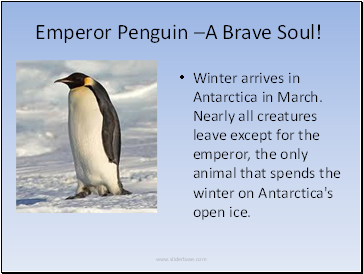 Nearly all creatures leave except for the emperor, the only animal that spends the winter on Antarctica's open ice. How they bring up their babies! Penguins are warm-blooded birds as humans but still lay eggs. 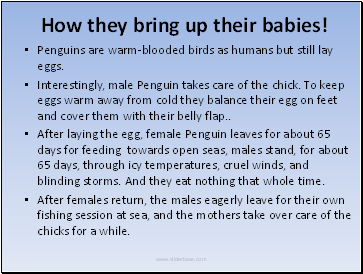 After laying the egg, female Penguin leaves for about 65 days for feeding towards open seas, males stand, for about 65 days, through icy temperatures, cruel winds, and blinding storms. And they eat nothing that whole time. After females return, the males eagerly leave for their own fishing session at sea, and the mothers take over care of the chicks for a while. 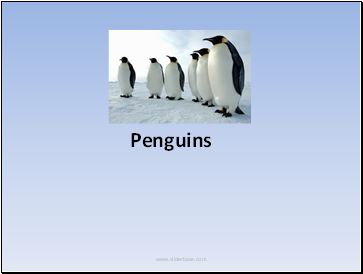 There are about 17-20 different species of penguin and around 100 million penguins are there in the world. Penguins seem to have no special fear of humans. 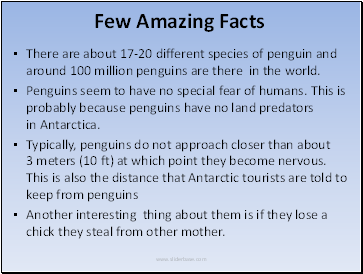 This is probably because penguins have no land predators in Antarctica. Another interesting thing about them is if they lose a chick they steal from other mother. Penguins can walk faster than humans even when they seem to waddle while walking. Penguins know Yoga ! 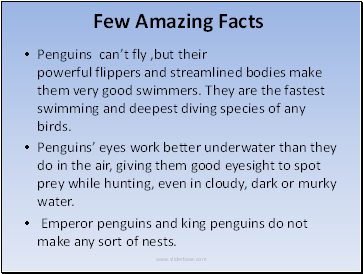 They can hold their breath for 20 minutes under water and can leap in water while swimming. Penguins love to store stones that help them to float in water. 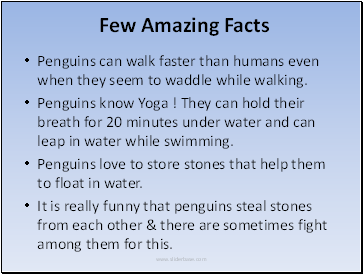 It is really funny that penguins steal stones from each other & there are sometimes fight among them for this.